A tall growing upright switch grass, the Northwind Panicum virgatum is a warm season native grass. This upright panicum is colorful throughout the growing season starting in spring with green foliage changing to blue for summer and then golden foliage for fall and winter. 2014 PPA Plant of the Year. Grows 4 to 5 feet tall with a spread of 2 to 3 feet. 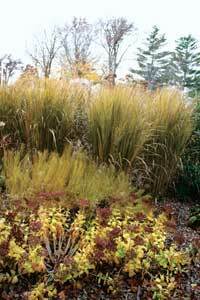 For a solid Northwind Panicum hedge, space plants 20 to 24 inches apart. For more information on Northwind Panicum Switch Grass visit Horticulture Magazine.